Why such a dramatic increase? Well for starters, SaaS allows small organizations to implement business applications that traditionally were expensive and only used at the enterprise level. Although SMBs have easier access to these applications, many still face some common barriers with adopting a SaaS solution. When implementing a solution, the organization as a whole needs to become accustomed to the application. Successful companies use SaaS as a tool to give them the information they need so they can be more effective. When you implement an application, you cannot hold the preconception that people do not like change or that everyone has their own way of handling information. Let us be clear here, it is not about each person individually, it is about the team as a whole. It’s about the organization’s goals and achieving them, which in the end benefits each person. Many organizations transitioning from one application to another, don’t realize migrating data can take time. The solution needs to prevent against data duplication and provide mechanisms for cleaning up existing data. If duplicate entries exist for a company or person, you should be able to merge them, removing the potential for overlap or mistakes. Additionally, having additional built-in information sources (i.e. LinkedIn, RSS feeds, Twitter) makes it easier to see the big picture and mine leads. E-mail, Rolodex, and calendar systems like Outlook need to be integrated so that everyday valuable information is not lost and data duplication is not necessary. 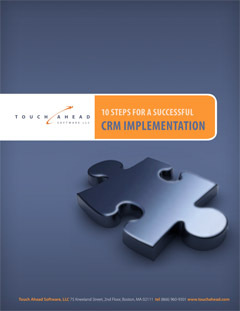 This entry was posted in Blog and tagged advantages, CRM, SaaS. Bookmark the permalink.